I received product from Simply Earth in order to facilitate this post; All opinions are my own. This post contains affiliate links. Hi, guys! 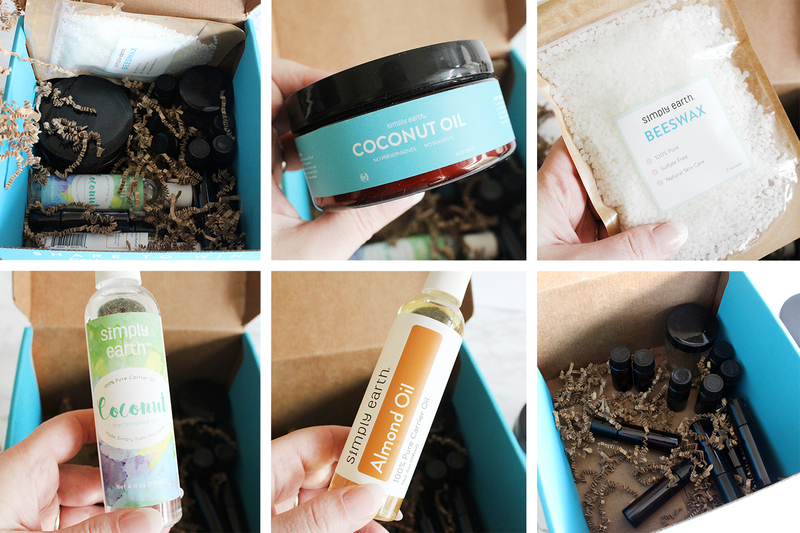 Today I'm excited to show you a brand new kind of subscription box! 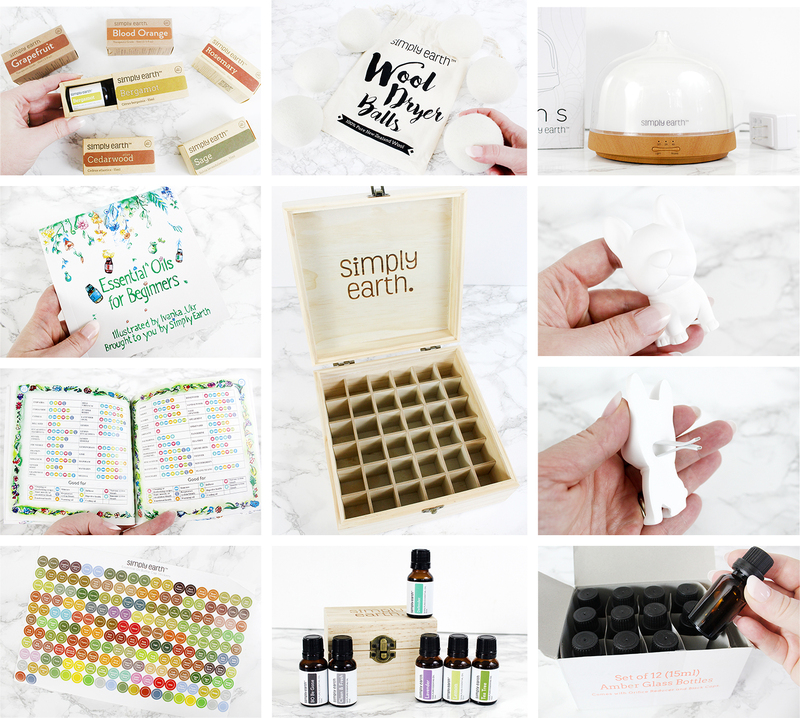 It's a recipe box containing everything you need to make cool natural DIYs using Essential Oils! Each month you get a box with 4 full-sized essential oils and all of the items you need (including containers) to make 6 natural recipes for your body, health, and home. You guys know how much I love to make my own bath bombs, scrubs, and masks, but I haven't gone very far beyond beauty, bath & body, and a few homemade cleaning products. 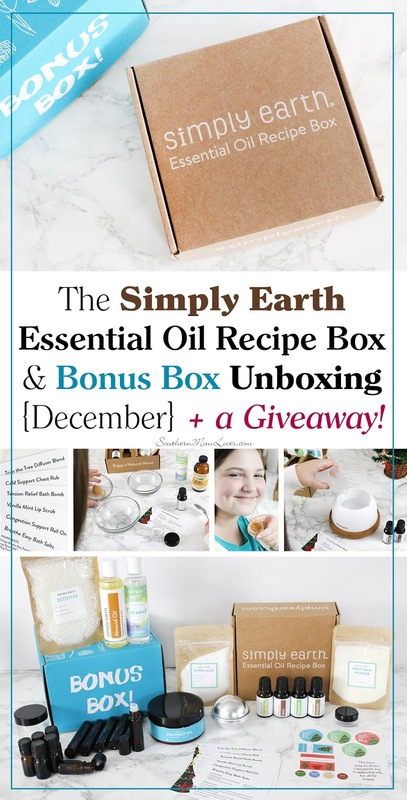 When I was contacted by Simply Earth to try out one of their monthly Essential Oil Recipe Boxes, it really inspired me to go farther. (clockwise from top-left) individual oils, wool dryer balls, essential oil diffuser, car diffuser, extra bottles for your own mixtures, themed gift sets in wooden boxes, bottle top stickers for easy identification, the Essential Oils for Beginners book (there is a free ebook version on their site), and a 36-bottle wooden box to store and organize all of your oils. 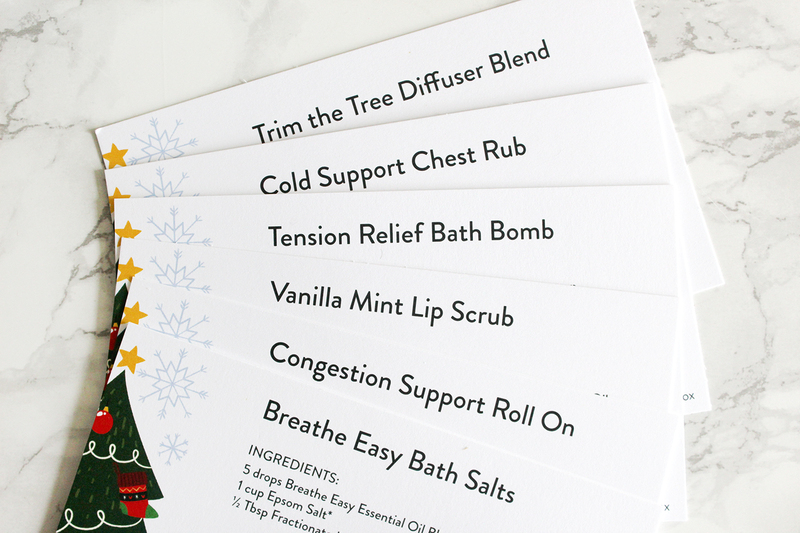 December's Essential Oil Recipe Box is holiday/winter-themed and has 6 recipes + extras inside. 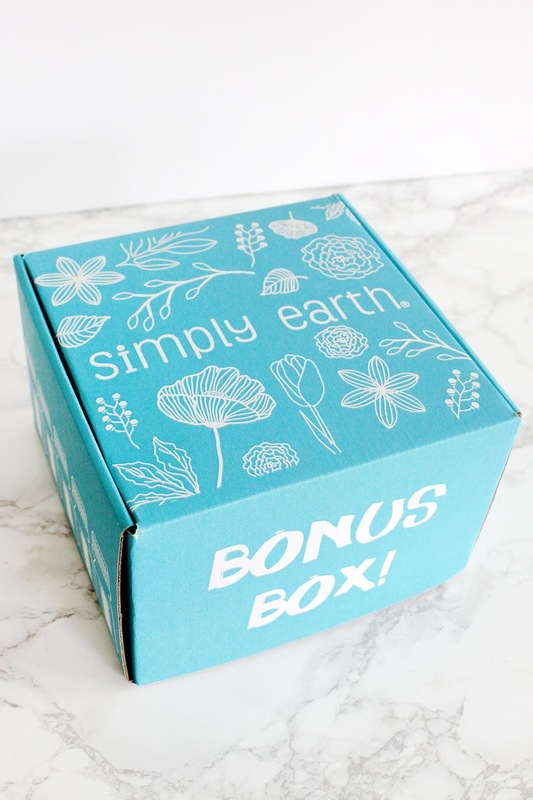 I should mention that along with your first box you'll receive a big Bonus Box that contains extra ingredients and containers that you'll use throughout your next 6 months of recipe boxes and you'll receive a new Bonus Box every 6 months! It's a crazy value once you see what's inside, so let's unbox them! First up, there are 6 recipe cards in your box. I didn't expect them to be actual recipe cards. Now all I need is a recipe box to collect them in! Sounds like fun, but also totally helpful for this time of year! There is also a sheet of labels for your bottle tops and for the containers your recipes will go in. Next up is a bath bomb mold, which is a nice, big, metal mold and not the cheap plastic type. 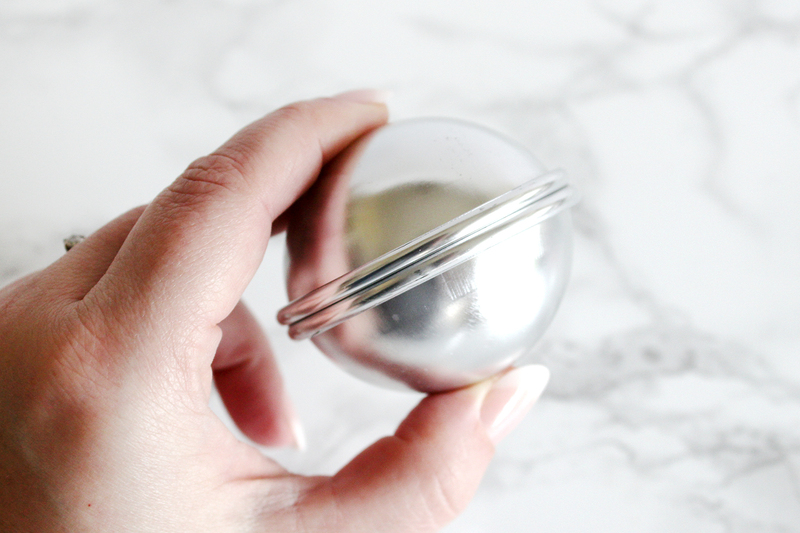 You don't have to worry about breaking it and it will last you through all of your bath bomb ideas! I love that they help you start a real DIY kit with the included supplies. 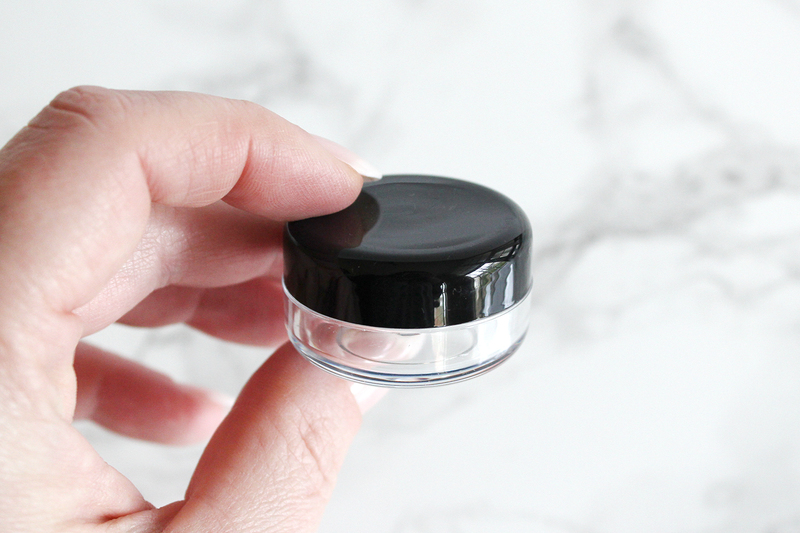 Next out is a small, screw-top container for your lip scrub. 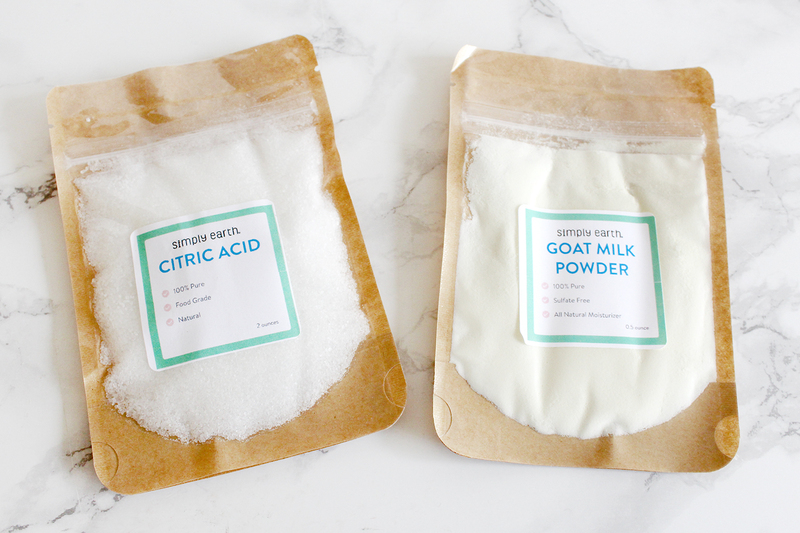 The box also contains a bag of Citric Acid and a bag of Goat Milk Powder. I have to say that this packaging had a lot of thought put into it. The bags have zipper tops so that you can reseal and save any extra and the bottom of the bag opens up into a foot so you can stand these up for storage if you like. Nice! 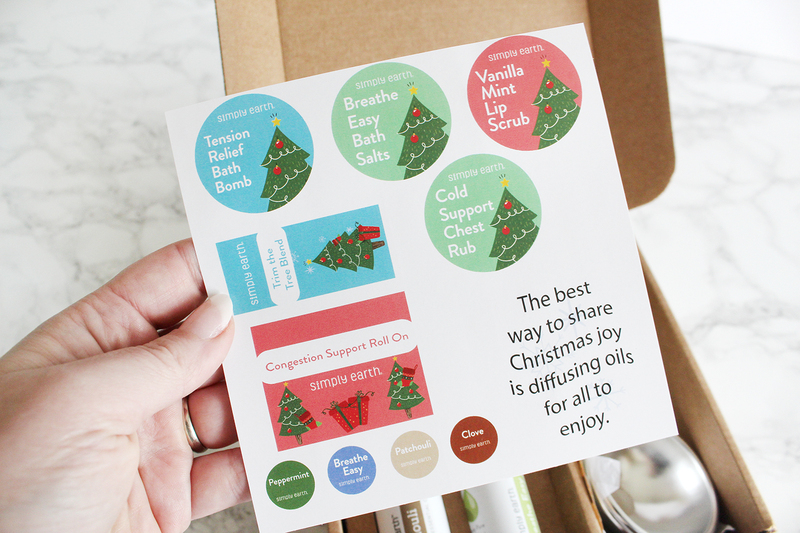 Lastly, there are 4 full-sized essential oils, themed for the season, to use in your recipes. 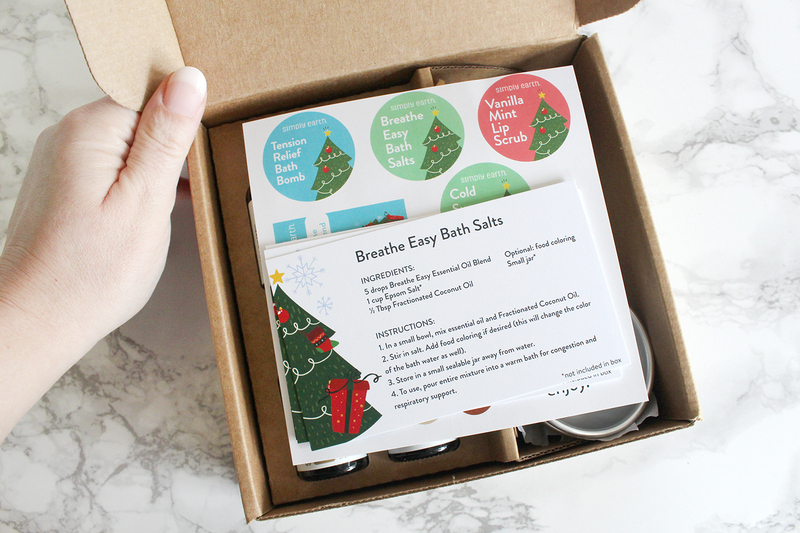 This month they sent (single oils) Clove, Peppermint, Patchouli, and (blends) Breathe Easy. I think this is a great way to learn new natural recipes and to learn about new oils that you may not have thought about using before. Now let's see what's in the Bonus Box! 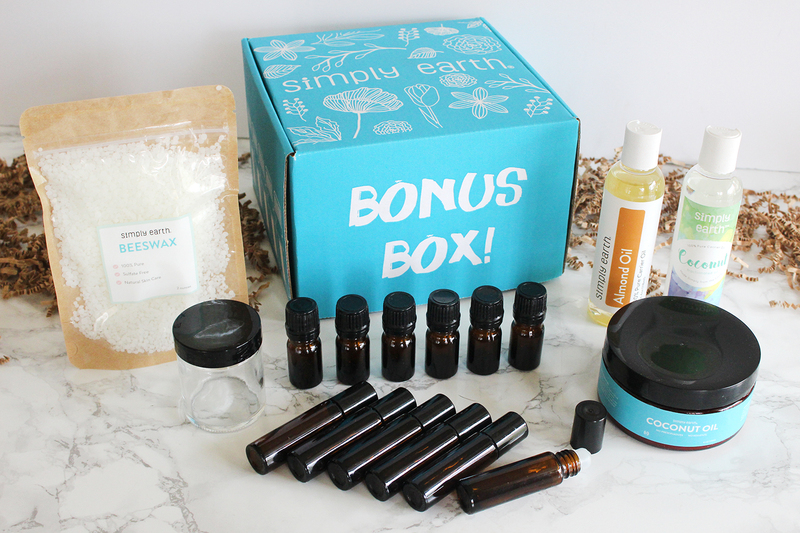 There are a huge amount of extras in the bonus box including additional recipe ingredients, carrier oils, and good quality glass containers. It contained: a 6 oz. jar of solid coconut oil, a 2 oz. bag of beeswax pellets, a 4 oz. bottle of fractionated coconut oil, a 4 oz. bottle of almond oil, and extra containers that included a larger 2 oz. clear glass jar, six 5ml amber glass bottles, and six amber glass roll-on bottles. My daughter and I immediately wanted to get started with a few of the recipes. 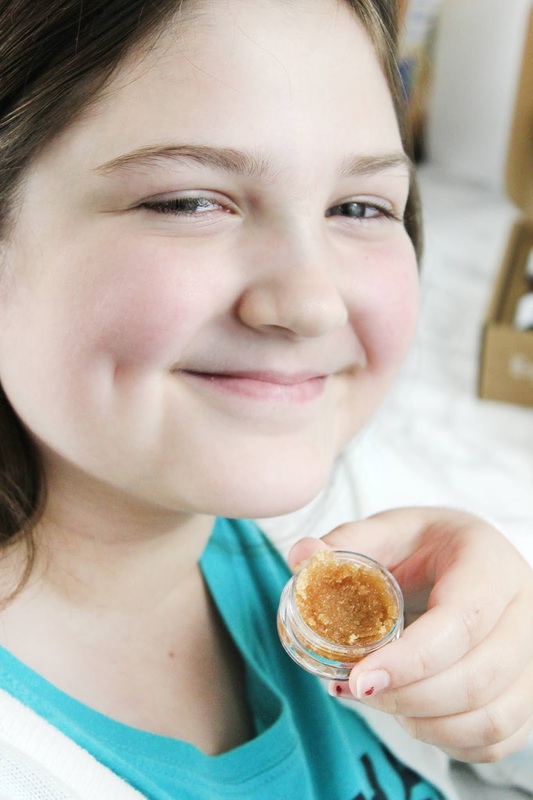 They were all easy to make, and we started with the Vanilla Mint Lip Scrub. 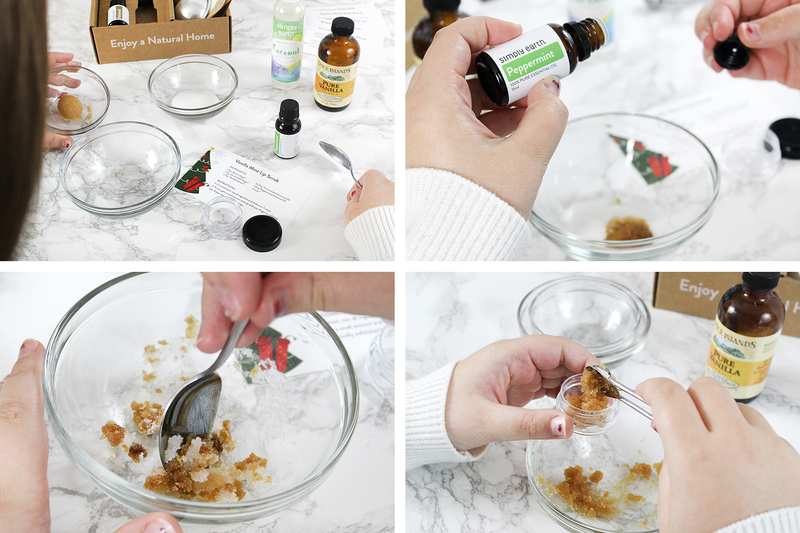 It required a few extra ingredients that we had in the kitchen (granulated sugar, brown sugar, vanilla extract), along with the Peppermint oil and jar from the Recipe Box and the fractionated coconut oil from the Bonus Box. I love that everything comes complete for a nicely packaged end product. These would make great stocking stuffers, too! 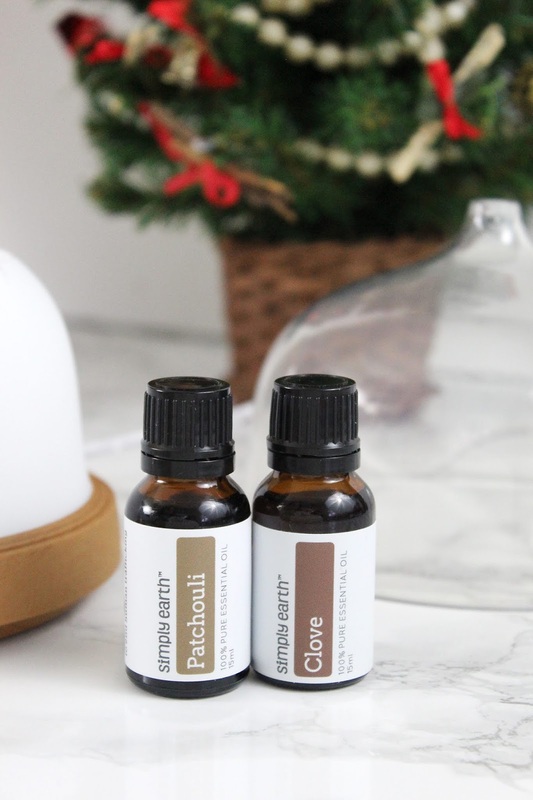 Next, we tried the Trim the Tree Diffuser Blend recipe. 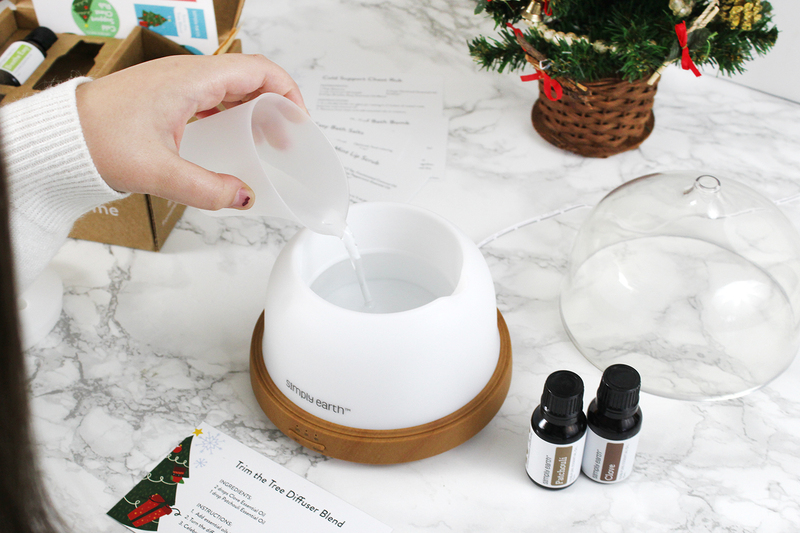 If you haven't used an essential oil diffuser before, it works similarly to a humidifier to which you add essential oils. It blows scented steam that fragrances your whole house. You could also use it with certain oils to help with chest congestion or a cold, too. 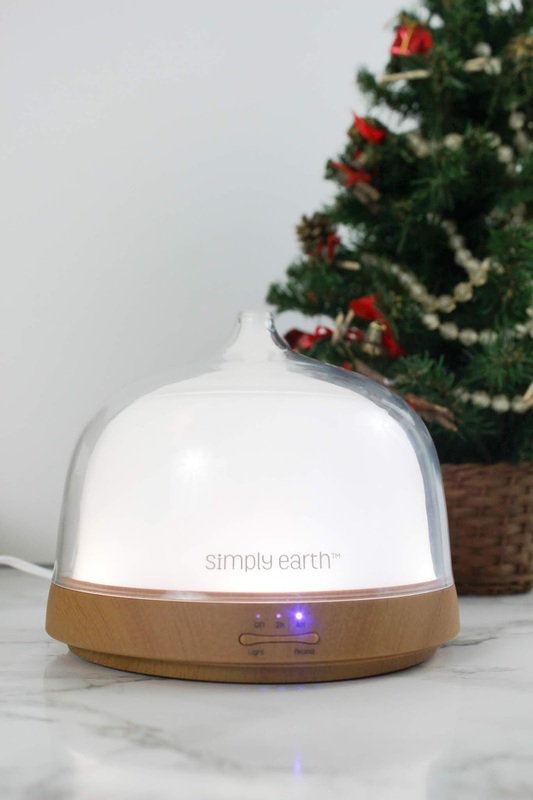 The diffuser from Simply Earth is very nice and we had a surprise when we turned it on, too. It has a lighted function where it scrolls through colors! My daughter adored it and the blend was warm and inviting. So there you have it! 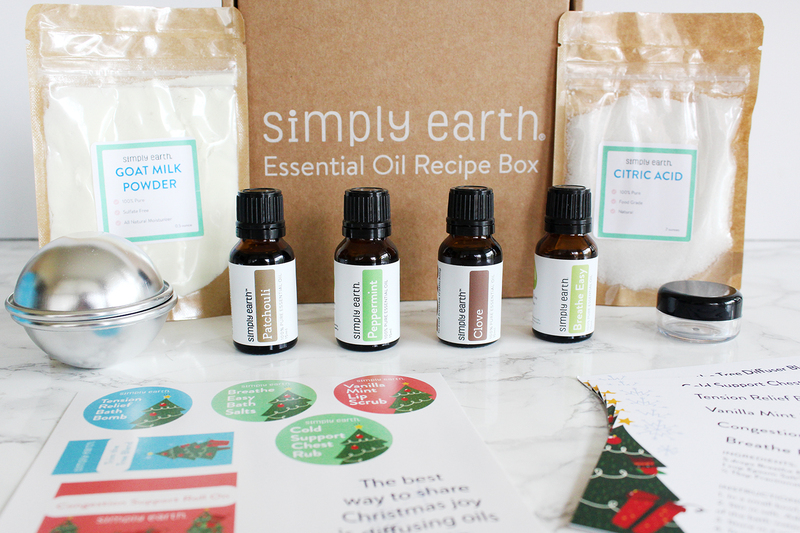 The December Essential Oil Recipe Box & Bonus Box from Simply Earth. 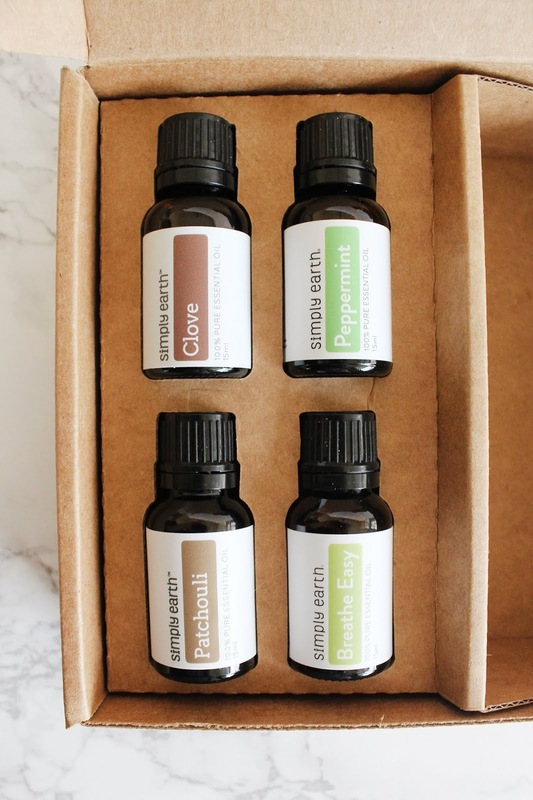 This subscription box is only $39 a month for 4 essential oils + all of the ingredients and containers you'll need to try 6 new recipes every month. You'll also receive the Bonus Box with your first month and every 6 months after that FOR FREE! Plus, the shipping is free and you can pause or cancel your subscription at any time. On top of that, I was given a code so you guys can get a free $20 gift card with your first month's box that can be used to shop in the store or get $20 off your next month's box! Use the code SOUTHERNMOMGIFTFREE here: http://bit.ly/SimplyEarthBox. I was amazed because I've bought lots of these types of products individually for my DIYs and ended up paying so much more. 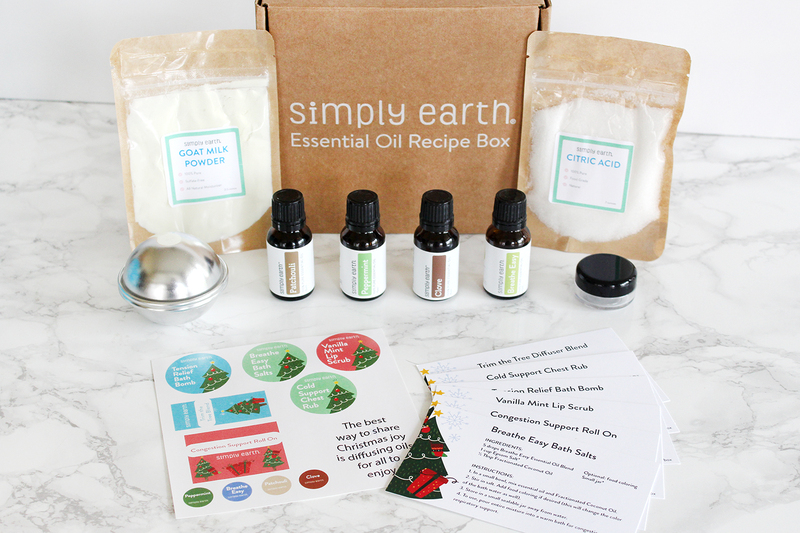 Not only are they a great value, but the quality is awesome; I just can't recommend them enough and Simply Earth wanted to give one of my readers the chance to try out an Essential Oil Recipe Box + a Bonus Box for themselves! 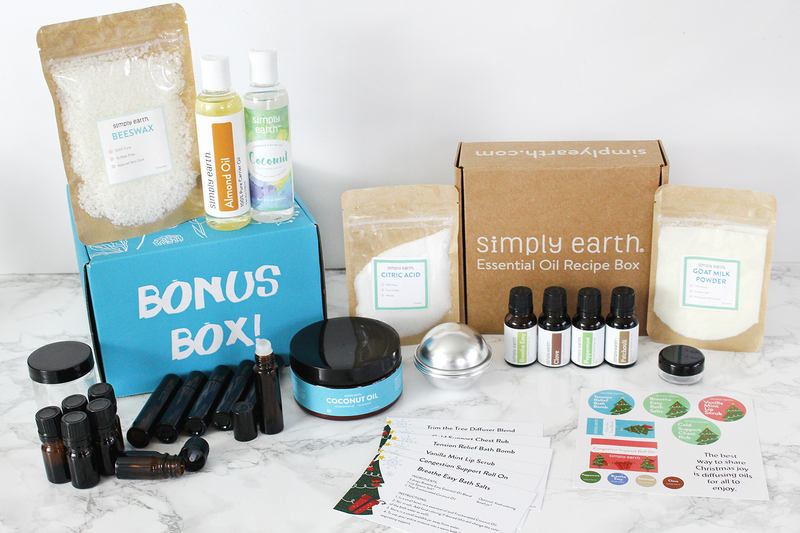 Welcome to the Simply Earth Essential Oil Recipe Box Giveaway! 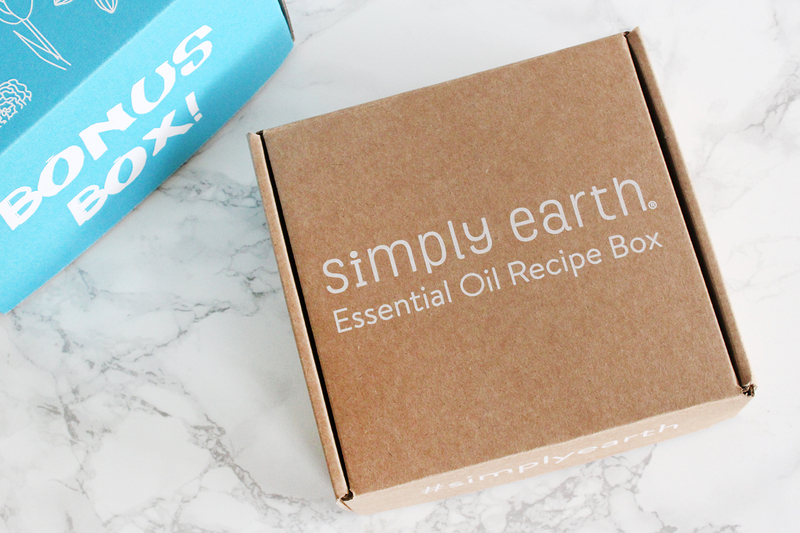 One winner will receive an Essential Oil Recipe Box + a Bonus Box from Simply Earth! Giveaway begins on 11/26/18 at 1:00 am CST and ends on 12/17/18 at 11:59 pm CST. Must be 18 years or older, open to residents of the US/CAN only (void where prohibited.) Once winners are confirmed, they will be added to the Winner's List here. Make sure to bookmark this page and come back for the daily entries! Disclaimer: No purchase is necessary to enter. One entrant per household, per IP address. All entries will be verified. Void where prohibited by law. Winner will be contacted by email; Please add southernmomloves@gmail.com to your whitelist. Simply Earth will be responsible for prize delivery to the winner. This giveaway is in no way administered, sponsored, endorsed by, or associated with Facebook and/or Twitter, Google, Pinterest, or any other social media platform.